After the QShave disaster last week I’m ready to get my face back to a healthy state and to do this I’m using two things. 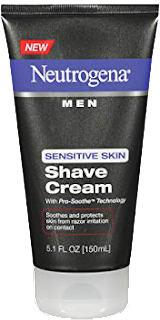 First a great razor second Neutrogena Men Sensitive Skin Shaving Cream. I picked this up a few weeks ago and had it waiting until the time was right and today is that day. Due to the horrible shave last week I have some skin issues which need TLC really quick. So I’m putting this shaving cream to the test to see just what kind of support it can give me. The crowdfunding campaign for Pereira Shavery's unbreakable bowl is now live - and the cost per bowl is lower than expected. You can also get a set of the bowl, a shaving brush and a puck of Pereira's awesome shaving soap. This week I had the pleasure of using something that came in quite handy. I was trying a new razor and when I do this the results tend to vary from amazing to disaster. I never know what to expect. It’s very rare that a razor as cheap as the one I was about to review wouldn’t have some issue. This was a QShave razor which cost about $7.00 and the shave felt like one as well. I had this razor waiting in the wings for some time reluctant to try not only because of the damage a razor like this can produce on ones face but as the year is coming to an end so are my options for reviews. So I reluctantly reach for this and then remembered I could be saved by another product if I did the review on both so I also included Bart’s Balms and thank god I did. Last week a box arrived from our current giveaway sponsor Pereira Shavery and inside was an amazing shaving bowl that of the likes I’ve never seen before. Many of you who follow me on social media know I love to use a shaving bowl so when this one came to me to review from our current sponsor I just held my breath and said well I hope this is a good one.